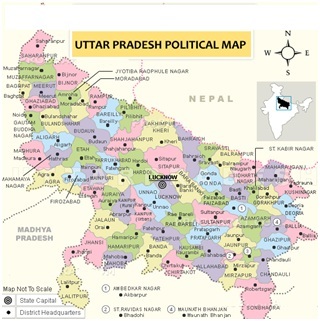 Uttar Pradesh is surrounded by Bihar in the East, Madhya Pradesh in the South, Rajasthan, Delhi, Himachal Pradesh and Haryana in the west and Uttaranchal in the North and touches Nepal the northern borders of Uttar Pradesh. It’s the most populous state of the country. Area wise (2,36,286 km2) it is the fourth largest State of India. In sheer magnitude it is half of the area of France, seven times of Switzerland. Its capital is lucknow. Uttar Pradesh is surrounded by Bihar in the East, Madhya Pradesh in the South, Rajasthan, Delhi, Himachal Pradesh and Haryana in the west and Uttaranchal in the north and Nepal touch the northern borders of Uttar Pradesh, it assumes strategic importance for Indian defence. Its area of 2,36,286 km2 lies between latitude 24 deg to 31 deg and longitude 77 deg to 84 deg East. Area wise it is the fourth largest State of India. In sheer magnitude it is half of the area of France, three times of Portugal, four times of Ireland, seven times of Switzerland, ten times of Belgium and a little bigger than England. Paddy, Wheat, barley, Millet, Maize, Urad (Black Gram), Moong (Green Gram) Arhar etc. Lime-Stone, Dolomite, Soap Stone, Gypsum,Bauxite,Glass-sand, manganese, Non-plastic fire clay etc. Piparhava, Kaushambi, Shravasti, Sarnath,Varanasi,Kushinagar, Chitrakoot, Lucknow, Agra, Jhansi, Meerut etc.